Nearly all of the 16 proposals currently being considered as New York state casino sites are within a 25-mile radius of a college or university. Three of the more-elaborate plans are located minutes from large schools. Through dumb luck, I was able to pass through the WSJ subscription wall once and see more than the first three sentences. 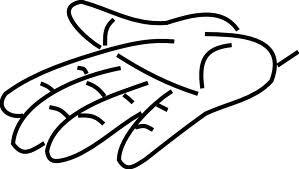 That was enough to read the entire article and conclude that (1) giving the college proximity issue national exposure is a very good thing; but, (2) reporter Vilensky needs a pedometer or a quick lesson in reading the legend on a map. In telling of the proposed casino closest to a college, Vilensky says the Schenectady casino would be “less than 3 miles from Union College and Schenectady County Community College.” I’m not sure how he was led astray. He did talk with someone from Rush Street Gaming, and maybe he also saw the Galesi brochure for Mohawk Harbor, which proclaims it to be “in the heart of downtown Schenectady,” and he got confused. The WSJ article also reports on the phenomenon of colleges starting to offer degrees or certificates in Gaming Management and related fields. It somehow missed the fact that Schenectady County Community College now has a casino management program as well as a partnering agreement with Rush Street Gaming. The Schenectady Casino is the only proposed location and Applicant that directly threaten the welfare of a student body of potential young gamblers living no more than a few blocks away. 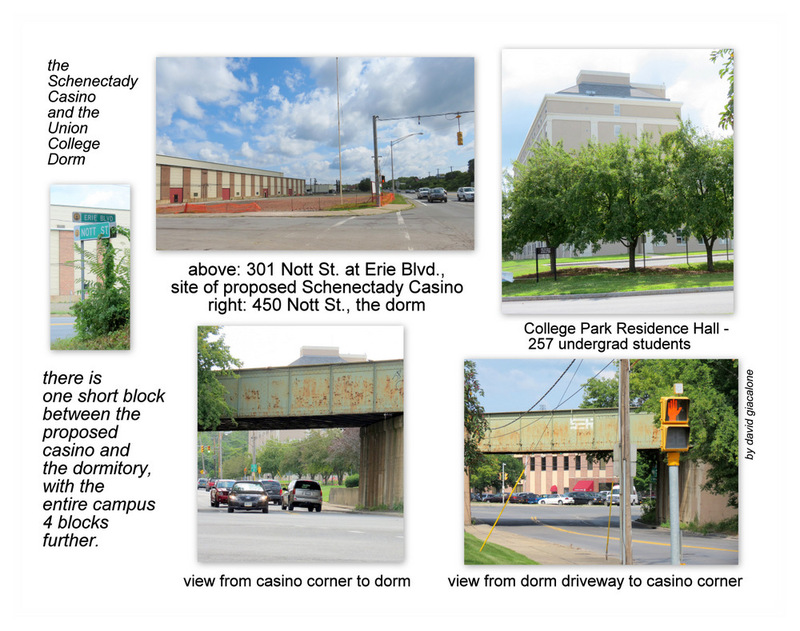 Schenectady’s Stop the Schenectady Casino group believes that placing a casino facility at Mohawk Harbor, in such close proximity to the residence halls and other residential housing of Union College, and less than a mile from Schenectady County Community College, unnecessarily endangers the welfare of many young gamblers and potential gamblers. No other competing application poses a similar risk to young adults of gambling age by making access so easy and quick. 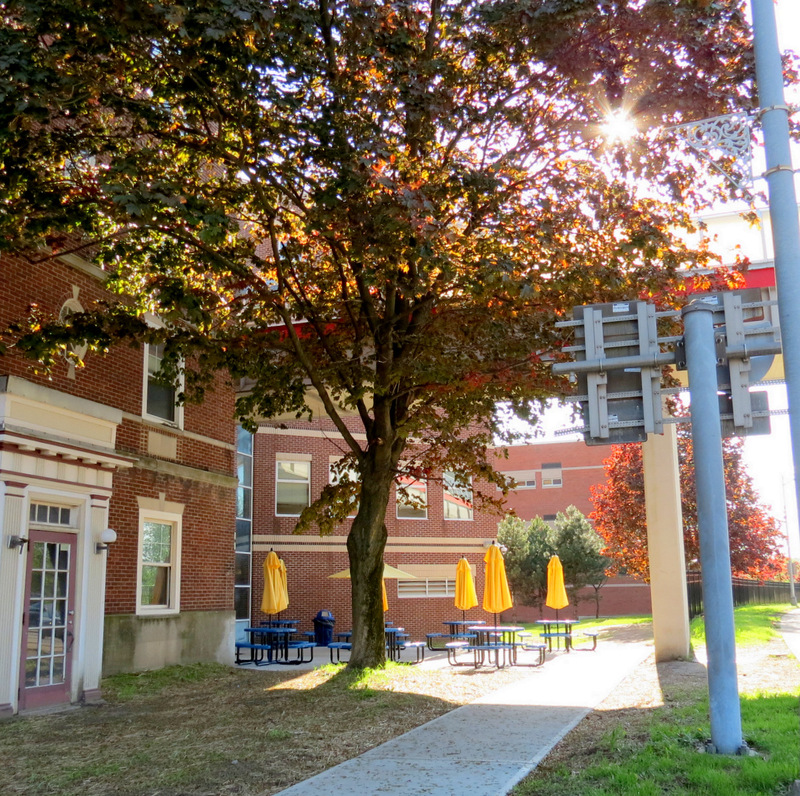 As can be seen in Attachment 1 and Attachment 6 (above), Mohawk Harbor’s casino facility, located at 450 Nott Street, is a short stroll from virtually all of Union College’s student housing, and only one short block from its largest residence hall at 301 Nott Street. The risk is heightened because Rush Street Gaming is experienced in marketing to the Young Gambler and appears to be most desirous of gaining their trade. For example, Rush Street Gaming’s SugarHouse Casino in Philadelphia has introduced a “simplified craps game” called Props & Hops (purportedly alluding to craps terminology), which was developed because “A lot of people, especially the younger kids, are intimidated about craps.” They have also greatly increased the number of poker tables at SugarHouse, a game particularly popular with college students. Their Schenectady Application shows that the Schenectady casino will have a dozen poker tables in a 3000 sq. ft. hall. Perhaps more worrisome is a recent Report stating that Rush Street Gaming is investing millions of dollars with the aim of becoming the industry leader in “building a bridge” between children playing casino-like games on social media and smartphones and their going to brick-n-mortar casinos to do real gaming once they are old enough. Knowing that the earlier you begin to gamble, the more likely you are to gamble often and obsessively, Schenectady’s proposed casino operator is sowing the seeds digitally to grow the next generation of problem gamblers. “has quietly pursued an Internet strategy that has sidestepped gambling regulators while also explicitly allowing players as young as 13″ to play their virtual games. If Rush Street thinks it is worthwhile to groom adolescents into future casino customers, what will Rush Street Gaming do to prepare 18, 19 and 20 year olds down the block who already love poker and “keggers”? 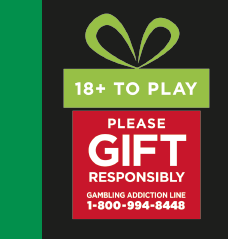 Rush Street’s denial in its Application that proximity and access increase the prevalence of problem gambling also suggests that they need a significant amount of sensitivity training before being allowed to operate near so many potential young gamblers. It is ludicrous for the Applicant to brush off worries about creating more problem gamblers, saying, “the addition of gaming at the Rivers Casino is not expected to lead to an increase in the prevalence rates in the local area”, because people in this area have already been able to travel for slots in Saratoga and casinos in Atlantic City and Connecticut. Other things being equal, we hope this Board will choose to locate the Capital Region casino farther than a short stroll away from a couple thousand potential young gamblers. For example, see “Festering Beneath the Surface: Gambling and College Students, by the Illinois Dept. of Health Services; “College Problem Gambling Literature Review“, Jim Emshoff, Ph.D., Georgia State University (Jan. 2008). 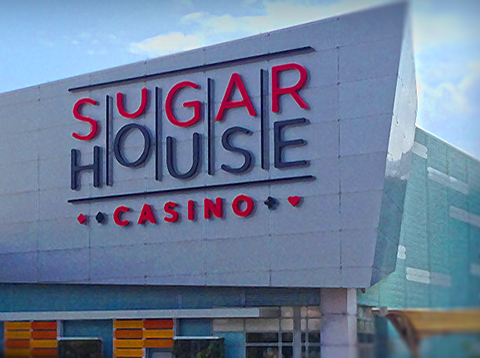 See SugarHouse Press Release, April 30, 2014; and “Sugarhouse Develops a New, Simplified Craps Game For Younger Players“, CBS6 Philadelphia, May 1, 2014; SugarHouse Props & Hops Brochure.
. share this posting with this short link: http://tinyurl.com/CollegeCasino . follow-up: Note: in addition to the many issues discussed below, the Casino will have a giant pylon sign structure at the corner of Front and Nott Streets, just a little over a block from the College Park Residence Hall. it will be 80′ tall, with a very large, inner-illuminated white sign declaring the name of the casino on top, and 32′-tall LCD screens on each of its v-wings, with nothing taller than a railroad underpass between the sign and the dormitory. 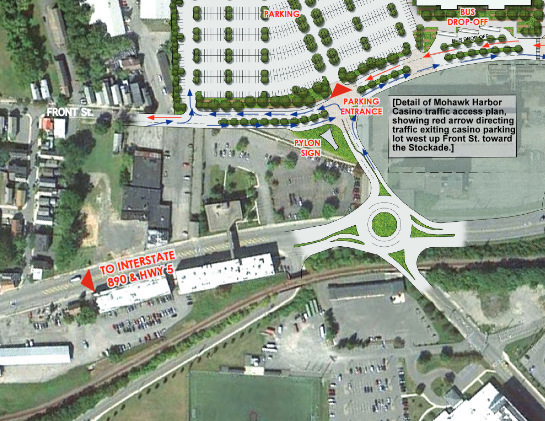 See, e.g., “bait and switch along the Mohawk“. 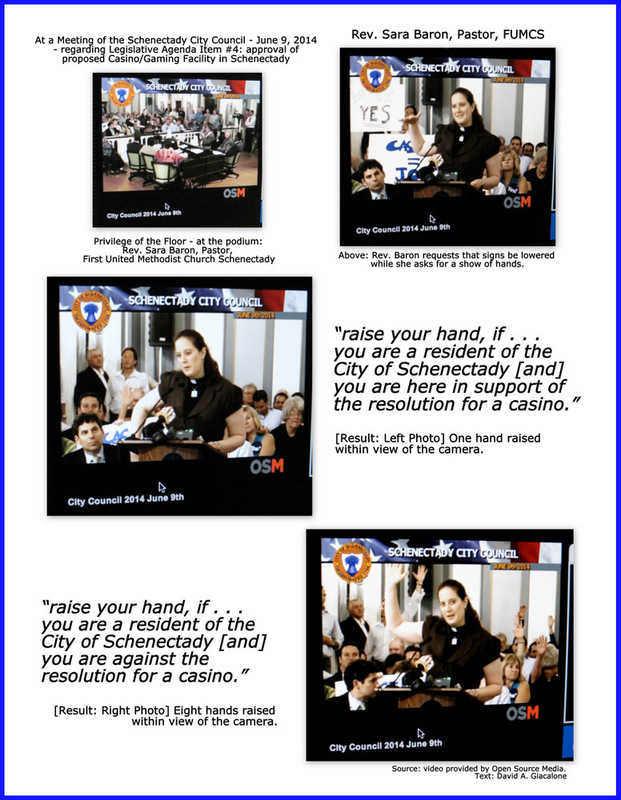 On Monday, September 22, 2014, two representatives of Stop the Schenectady Casino spoke before the casino Location Board at the Capital Region Public Comment Event. Mohamed Hafez made a rousing presentation of why a casino would harm the people and City of Schenectady, from the perspective of a landlord and businessman and of a resident trying to make a better Schenectady. In addition, our STATEMENT in OPPOSITION to the Schenectady Casino (20 pages, plus twelve Attachments) was submitted that day to the Location Board, with a signed Cover Letter. A brief summary of the five major points made and explained in the Statement, along with thumbnails and links to the attachments, can be found below. Unlike the other Capital Region locations proposed to the Board, the Schenectady Casino is the only Location Well on its Way to Being Fully Developed without a Casino, and Schenectady already has a Vibrant and Successful Development Process. The Applicant claims that the casino would remove the largest brownfield in New York State, but the site remediation process is almost complete and would have been done without the casino, as required for the $200 million Mohawk Harbor development. 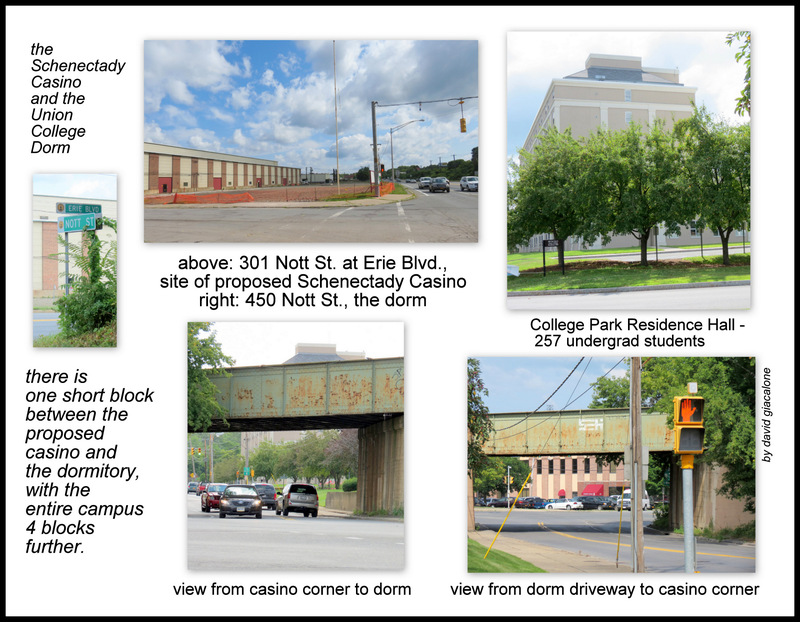 The Schenectady Casino is the only proposed location and Applicant that directly threaten the welfare of a full campus of potential young gamblers living no more than a few blocks away. Mohawk Harbor’s Urban Location has More Disadvantages than Advantages – e.g., increased probability of social ills due to problem gambling, more crime, a more regressive tax structure. 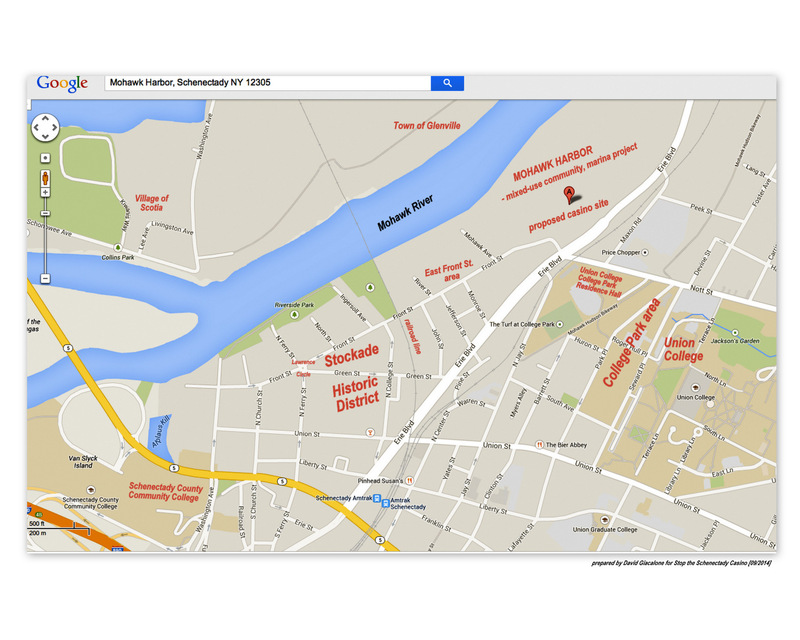 #1: a Map of the Vicinity . #5: the Applicant’s Traffic Access Plan targeting Front Street, in the heart of the Stockade ..
#7: Rev. 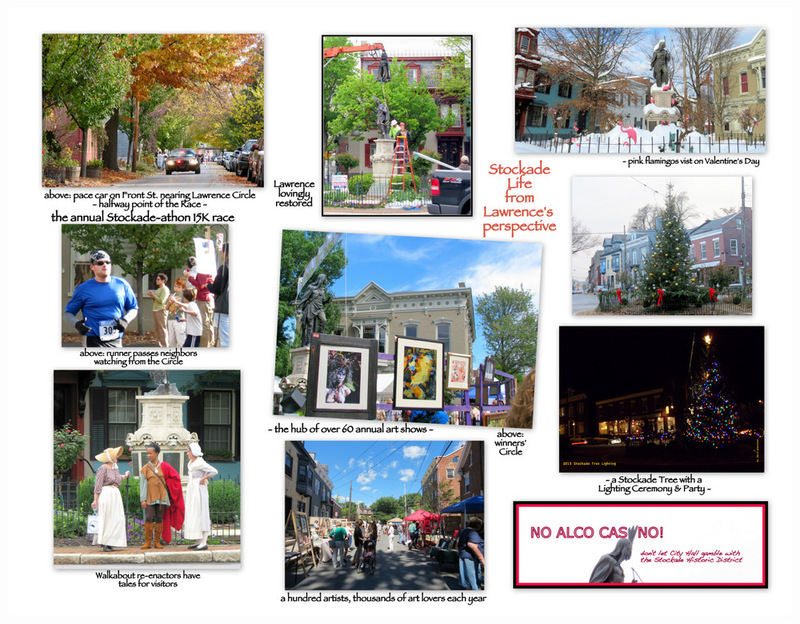 Baron’s Show of Hands . . . .
. . #12: a sample of our Petition Opposing the Casino, which we are submitting today with 363 signatures, 125 of them by people living in the Stockade Historic District (more people than were members of the Stockade Association over the past year). IN-PERSON: Seating is first-come, first-served. Pre-registered speakers should arrive 15 minutes before scheduled time to check-in. Walk-in speakers can register on-site on a first-come, first-served basis. ONLINE: The full hearing will be streamed live and archived on the Gaming Commission’s website at www.gaming.ny.gov. Written comments : May be submitted at the event or by email to CapitalRegion@gaming.ny.gov up to seven days after the hearing (September 29, 2014), to be part of the hearing record. NOTE: Comments received after Sept. 29 will also be considered by the Board as part of its RFA review process. what will the casino mean for Union College students? 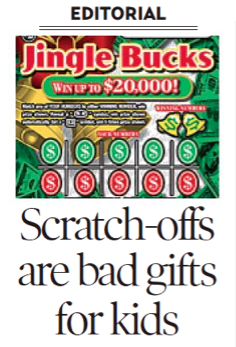 A Niskayuna mother (and managing partner of an Albany-Poughkeepsie law firm), Carol A. Hyde, asks some very important questions in a Letter to the Editor printed in today’s Schenectady Daily Gazette (“Union, SCCC will be affected by casino,” June 7, 2014, C7; available by subscription). Her main question is how the casino will affect already-poker-crazy students living practically right across the street? 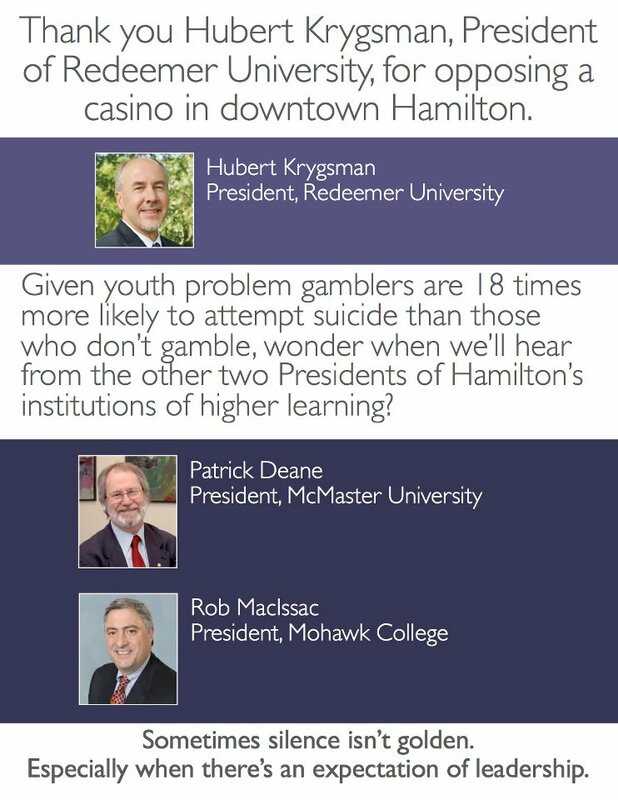 Will they study less and spend their money becoming gambling addicts? Click on the image at the front of this paragraph to read the Letter. Thank you Ms. Hyde for your letter, and thank you, Gazette, for printing it. Note: Union College has a policy requiring all undergraduate students to reside in College housing. From the perspective of the casino operators, the policy conveniently places the vast majority of the student body just an easy stroll away from the proposed casino. We should, of course, also ask how safe students, perhaps especially female students, would be or feel at night walking in the adjacent “College Park” neighborhood or on Campus, given the expected increase in street crime when the casino opens. [see the section on Crime below.] What other problems might we expect when a casino open 24 hours a day is located near a campus already known as a major party school (e.g., with the highest ranking among all small colleges; also see here), with an abundance of “keggers” and poker parties? Studies. There is a significant amount of literature and scholarship on college students and gambling, including the increased susceptibility of younger gamblers, alcohol’s connection to problem gambling, and the connection between proximity and increased gambling. For example: 1) College Student Booklet (Illinois DHS) “Festering Beneath the Surface: Gambling and College Students“; 2) Problem and Pathological Gambling Among College Students, Randy Stinchfield, William E. Hanson, Douglas H. Olson; 3) California Council of Problem Gambling, College Student Web pages; and, see our Issues Page re Young Gamblers for a fuller list. “Colleges and universities located near gambling facilities had higher rates of student problem gambling behavior for their students”, See “College Problem Gambling Literature Review“, Jim Emshoff, Ph.D., Georgia State University (Jan. 2008), and citations to other resources. Targeting the Young Gambler: (Aug. 1, 2014): Rush Street Gaming is experienced in marketing to the Young Gambler. For example, Rush Street Gaming’s SugarHouse Casino in Philadelphia has introduced a “simplified craps game” called Props & Hops (purportedly alluding to craps terminology), which was developed because “A lot of people, especially the younger kids, are intimidated about craps.” (See SugarHouse Press Release, April 30, 2014; and “Sugarhouse Develops a New, Simplified Craps Game For Younger Players“, CBS6 Philadelphia, May 1, 2014; SugarHouse Props & Hops Brochure.) They also greatly increased the number of poker tables at SugarHouse, a game particularly popular with college students. Their Schenectady Application shows that the Schenectady casino will have a dozen poker tables in a 3000 sq. ft. hall. We can also expect a Schenectady casino to organize or facilitate groups of students coming from neighboring states where you must be 21 to gamble. Gambling at a Casino appears to be more addictive than gambling online, according to work done at the Harvard Medical School Division on Addiction. See “Gambling Online, Gambling in Casinos: What’s More Addictive?” (The Atlantic, July 2014). “Racino” locations and Indian reservations may continue to allow 18 year-olds to gamble. Such facilities either send them into special under-21 areas or give them wristbands indicating they are under 21, so they won’t be served alcohol. Attempts by lawmakers and others to raise the gambling age at the racinos have gone nowhere in the State Legislature. 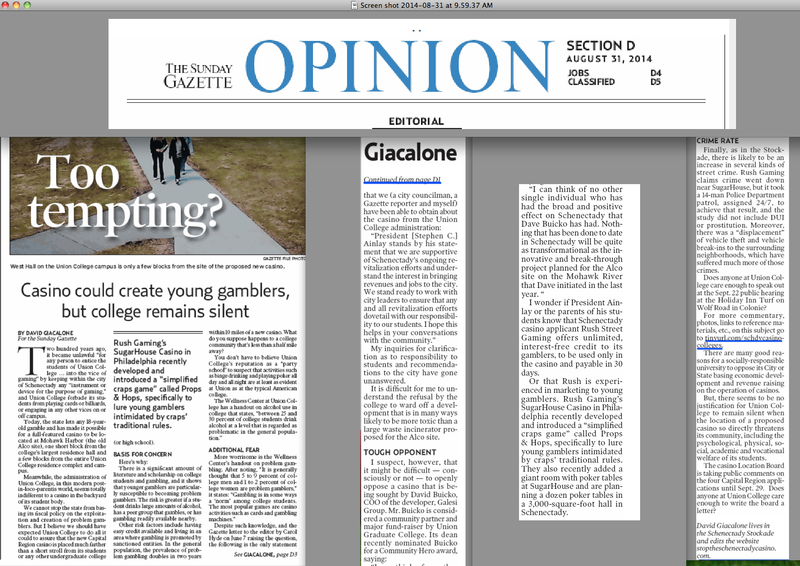 See, e.g., “Bill to raise gambling age to 21 reintroduced: Addabbo, Goldfeder sponsor proposal” (Queens Chronicle, by Dominic Rafter, Feb. 7, 2013); and the ChangeTo20 campaign. 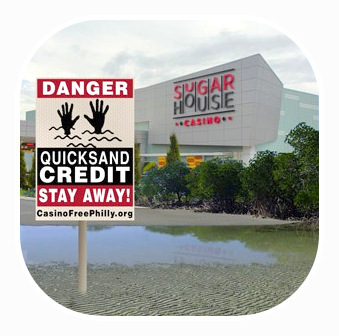 “Quicksand Credit“: As Casino-Free Philadelphia explains: “SugarHouse casino [owned by Rush Street Gaming], as well as most other casinos in the country, offer their customers unlimited lines of credit, which can only be used to gamble at the casino. There is no interest on the line of credit, and it must be paid back in 30 days.The casinos call this a “convenience” so you don’t have to carry large amounts of cash to the casino — but they’ll happily give you more cash than you have. Having access to a line of credit makes a person more likely to keep playing — making SugarHouse’s billionaire investors richer. During the last three or four years we have occasionally received calls from parents concerned about the amount of charges appearing on bank cards or credit cards. They felt that our recommendations and estimates here about money were too low and not realistic. Thus far, in each case where our estimates have been far off, it has turned out that students were attracted to a very rich and active life at a local casino in Brisbane. BE FOREWARNED! Gambling can be addictive and is very, very expensive. In the long run, one seldom ‘wins’. If you think you will give the casino a try, set a maximum budget IN ADVANCE and do not deviate from that sum. – how close would the casino be to Union College’s 2200 undergraduate students? 257 students at College Park Hall (former Ramada Inn) – about a block away. Indeed, the casino appears to be closer than any other restaurant or bar. 130 upperclass students in the renovated homes, and fraternity houses, comprising the College Park Neighborhood Apartments on Seward Pl. and Huron St. – 3 blocks away. update: A large new housing complex for upperclassman was announced at the end of July that would also be in the tiny College Park neighborhood. residence halls on main campus – 4 blocks away. 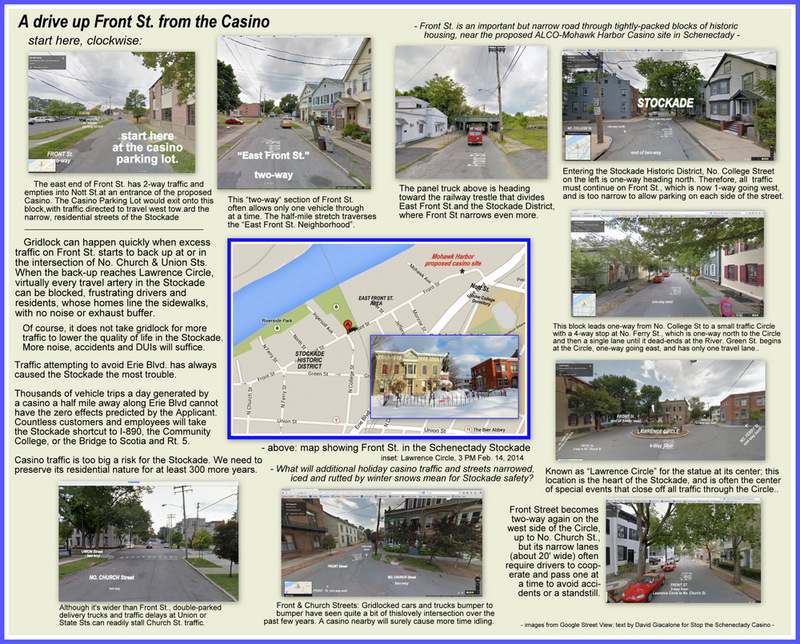 update (July 12, 2014): the new rendering of the casino project shows the casino itself located right at Nott Street and Erie Boulevard, so that all the young prospective gamblers (or the elderly from East Front Street) won’t need to trek a long distance into the 60-acre site. 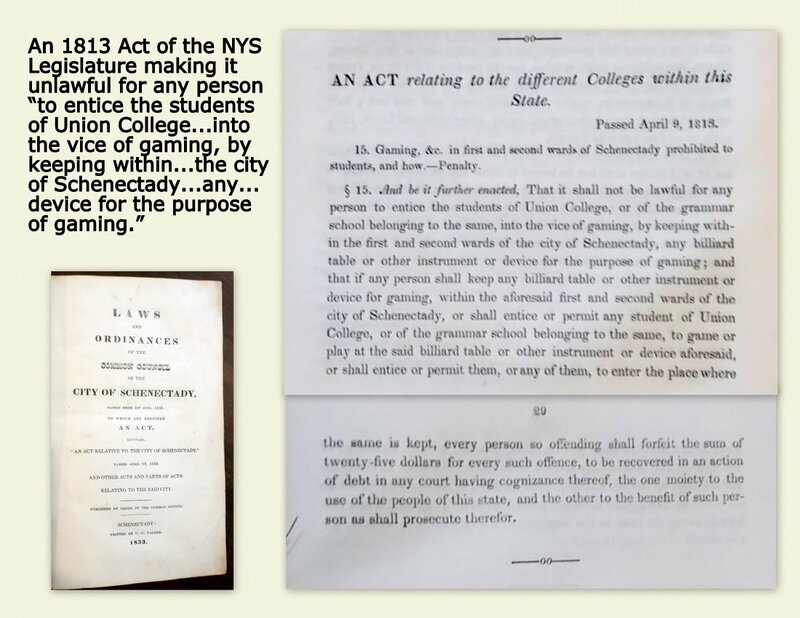 “[I]t shall not be lawful for any person to entice the students of Union College . . . into the vice of gaming, by keeping within the first and second wards of the city of Schenectady, any billiard-table or other instrument or device for the purpose of gaming” [with a fine of $25.00 “for every such offense”]. See The Laws of Union College (1915), at 46. Philadelphia PD created a 14-man dedicated police unit whose sole task was to patrol a one-half-mile square around the casino. 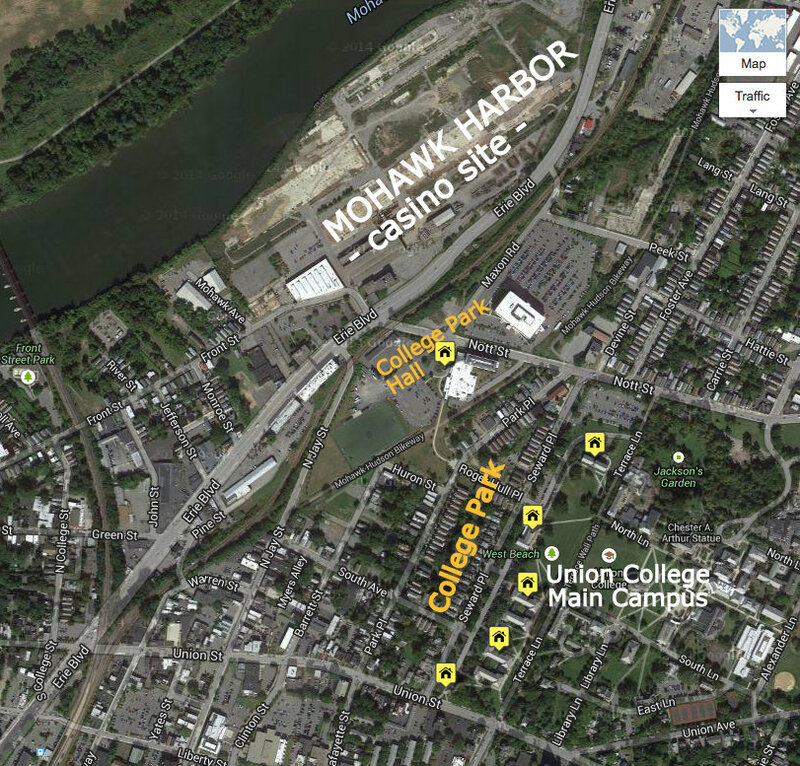 The casino would be less than a five-minute walk from the relatively new dorm off the Union College campus. One of the premier institutions in Schenectady, Union College is one of those high-tuition private colleges. Whatever I might think about the economic viability of a casino, if I was the parent of a high school senior picking a college and I had to pay that kind of tuition, I might find a casino across the street from the dorm to be concerning. Donation Deafness? Buddy Blindness? We don’t pretend to know why Union College has been so silent and evasive on the topic of the casino. It is difficult to avoid speculation on the institutional silence. Historians consider Union College to be the Mother of the American fraternity movement and system, and believe that the establishment of the first fraternities at Union College, in off-campus residences, in the 19th Century, was the beginning of the end of the in loco parentis concept (schools acting “in the place of parents”) at American colleges. But, UC’s apparent casino indifference can’t merely be because the Administration doesn’t want to sound like a worry-wort nanny or a substitute for Helicopter Parents. The School’s comprehensive Wellness Center and its Honor Code show that Union College does feel obligated to help its students to develop into healthy and socially-responsible adults. Is the President’s role as Fundraiser-in-Chief at the core of the School’s failure to voice concern over the proximity of the proposed casino? The pool of actual and potential big donors is not that large in a City as small as Schenectady, and its academic, business-development, and political “elites” can’t help rubbing elbows on boards of directors, at awards, cultural, and fundraising events, and private parties among friends. Is the Administration reluctant to ruffle the feathers or create bad will with business leaders as prominent as the heads of the Galesi Group, or with County, City and Metroplex officials whose cooperation might be important in the future? 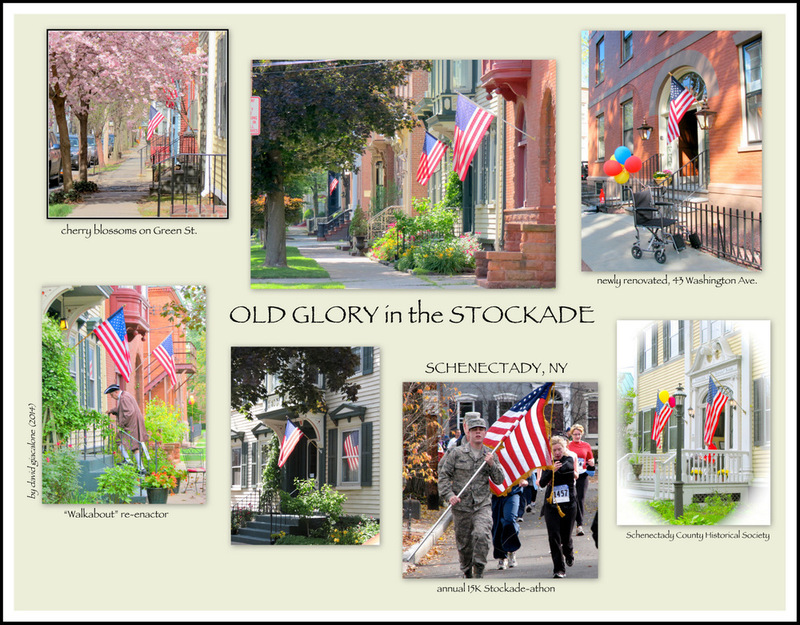 Is it afraid that it will tarnish its image as a main element in the “revitalization” of Schenectady and development of the region? “I can think of no other single individual who has had the broad and positive effect on Schenectady that Dave Buicko has had. . . .
Buicko is chairing Union Graduate College 2011 Scholarship Scramble golf tournament at Eagle Crest Golf Club in Clifton Park on September 16, 2011. How connections with community and business leaders mesh with Union College’s promise to “work with city leaders to ensure that any and all revitalization efforts dovetail with our responsibility to our students,” is an important question I hope will soon be clarified. Young people are viewed as the future of casino gambling. That future is not far off. More than any earlier generation, today’s young people are technologically primed for gambling. From an early age, kids learn to play games by tapping buttons and tracking images on screens. 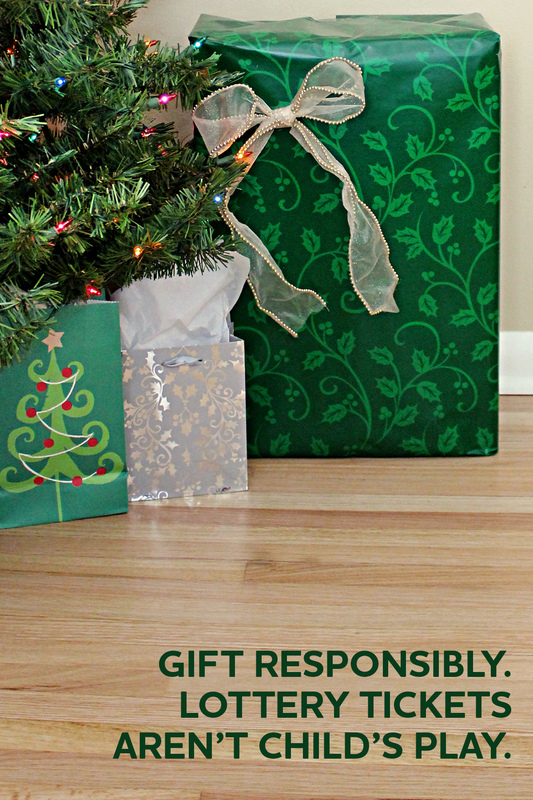 They spend money with a swipe of a debit card. They play video games. They live on social media. For these reasons, young people are a soft target for Internet gambling—the next frontier for legalized gambling. The first national U.S. survey of gambling among adolescents and young adults found that gambling among youth is widespread. It estimates that three-quarters of a million young people ages 14-21 are already problem gamblers. Vol. 13, No. 8), for an example of how the gaming industry perceives young gamblers and the challenge of appealing to them. The Teenage Protection Alliance has started the ChangeTo20 campaign, to make 20 the age of majority at which individuals may gamble. They are focusing first on New York, because of the rapid expansion of Casinos that is expected in the next year or two. We hope their work will help raise consciousness of the many problems caused by allowing teenagers to gamble. 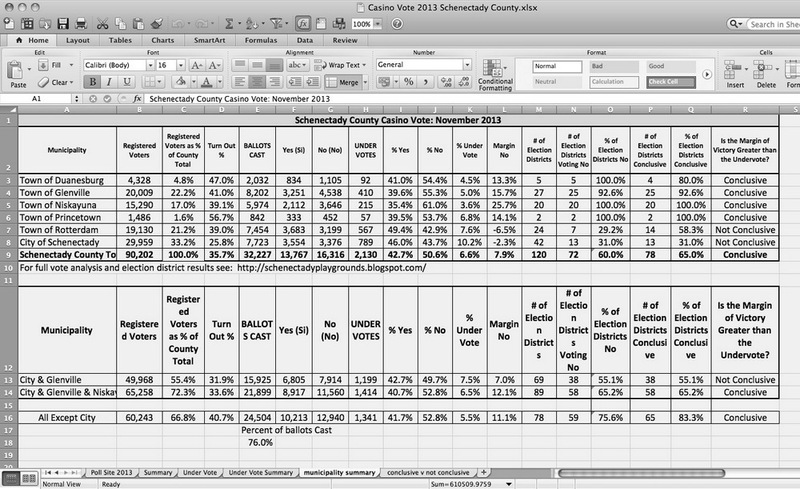 Schenectady County Community College. Yes, we are also worried about the effects of a close-by casino on the students at Schenectady County Community College. SCCC has about 2700 full-time and 1700 part-time students and now has a large residence hall. Anticipating the expansion of gaming in the State, SCCC started a Casino & Gaming Management A.A.S. Program, which will have close ties to the proposed casino. The main campus is less than one mile (by foot or car) from the proposed casino site (and I imagine many SCCC students will be cutting through the Stockade for a shortcut to the casino). 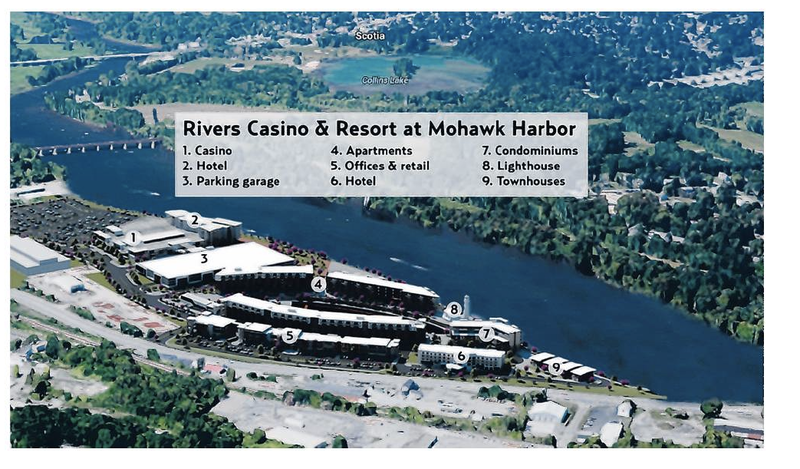 “Schenectady County Community College board of trustees will vote tonight to support the $450 million Rivers Casino and Resort at Mohawk Harbor, about a mile from its campus. Is the SCCC Board of Trustees aware that casino employees make up a very large percentage of the troubled people calling Problem Gambling Help Lines? Young employees and interns might, of course, be even more at risk than their older colleagues. Followup: See “Students all in on casino future: Many see SCCC program as ‘head start’ to local jobs’,” (Sunday Gazette, at C 1, by Zachary Matson, March 13, 2016). There are many good reasons for a socially-responsible university to oppose its City or State basing economic development and revenue raising on the operation of casinos. Moreover, there seems to be no justification for Union College to remain silent when the location of a proposed casino so directly threatens its community, including the psychological, physical, social, academic and vocational welfare of its students. Looming Pylon: Note: in addition to the many issues discussed above, the Casino will have a giant pylon sign structure at the corner of Front and Nott Streets, just a little over a block from the College Park Residence Hall. it will be 80′ tall, with a very large, inner-illuminated white sign declaring the name of the casino on top, and 32′-tall LCD screens on each of its v-wings, with nothing taller than a railroad underpass between the sign and the dormitory. See, e.g., “bait and switch along the Mohawk“. Union College President Stephen Ainlay said he has some concerns about a casino being built around the corner from the 120-acre campus off Nott Street. “Are there anxieties? Yes, there are,” he said last week after Union’s annual business campaign breakfast. “There are things we are worried about, so we’re watchful, I guess you would say.” . . .
Ainlay declined to comment on his specific concerns or a potential rise in problem gambling among Union’s undergraduates, but students at the college say they would visit a casino that’s only about a 10-minute walk from campus. Casino patrons must be 21 or older to gamble under terms of the Upstate NY Gaming and Economic Development Act. In June, Union had 500 graduating seniors, most of whom were 21 or older. The statement was sent to Schenectady Councilman Vince Riggi on July 1, 2014, by the Chief of Staff in the Office of the President on behalf of Pres. Stephen C. Ainlay. Riggi was promised a reply from Pres. Ainlay upon his return from vacation in mid-August, but he has not received one. The same response, verbatim, was sent to a Schenectady Gazette reporter. Our requests for amplification or clarification have gone unanswered. (September 1, 2014): Perhaps yesterday’s Viewpoints column in the Sunday Gazette, “Too tempting? 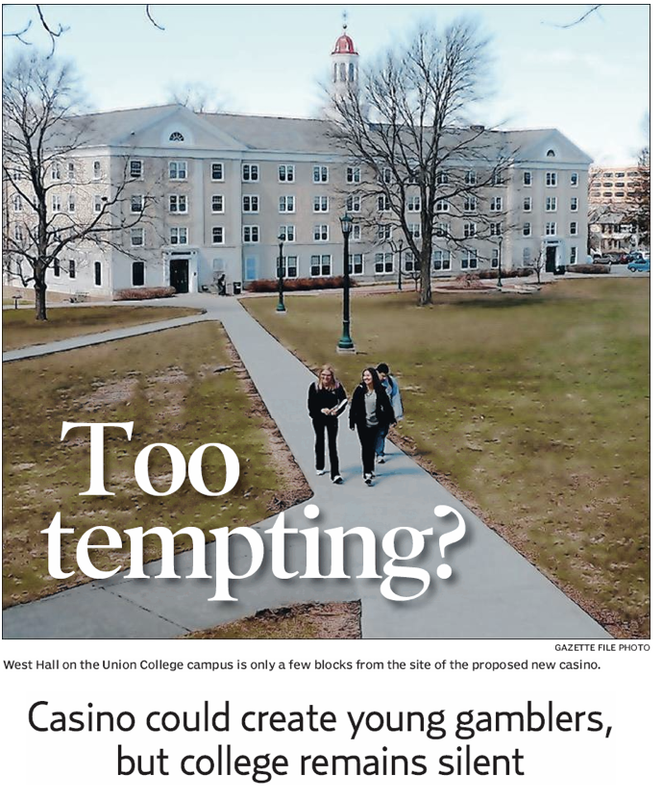 : Casino could create young gamblers, but college remains silent” (D1, August 31, 2014, by David Giacalone) will finally merit a response from the President’s Office, a professor, or some other responsible member of the staff. Click here for the text of the “Too tempting?” OpEd piece in a pdf file. update (March 29, 2015): see our posting “Taj casino doesn’t want a college next-door” (March 29, 2015).